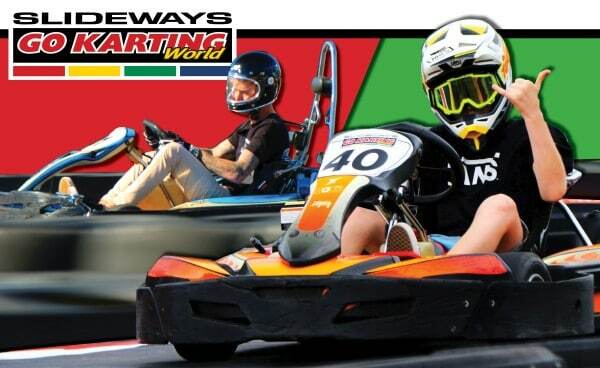 Slideways Go Karting Australia | Holiday Fun, Discounted Racing at Slideways! Holiday Fun, Discounted Racing at Slideways! Home News and updates Holiday Fun, Discounted Racing at Slideways! All three Slideways Go Karting Centres will be open right through the school holidays, so why not drop by for a race?! Highlights: Our massive new multi-level track is now open for racing! The facility now includes two massive second-storey structures at either end, as well as an all-new covered loop into the car park. The layout suits itself perfectly for drifting, with ace drivers able to link together all the corners! Highlights: Our massive, undulating, traditional outdoor race track, providing the ultimate challenge for drivers of all skill levels. Senior karts, family karts, kids karts and dual karts. Home of the Slideways Junior Karting Academy, weekly tuition from our highly experienced staff on the art of going fast! Highlights: The only three storey indoor drift go kart track in the southern hemisphere! Senior karts, kids karts and dual karts. The K’Indy Cars track is now open in our air conditioned Family Lounge, allowing drivers as young as three get behind the wheel for the first time! The Sprint Race day format sees all drivers receive 10 minutes of qualifying ahead of two 10-minute long races, with the senior drivers split between over and under 80kgs, with the kid’s classes split between 7-11 years old, and 12-15 years old. Meanwhile, the Enduro Series continues with the popular 90 lap/65 minute format, with a pair of compulsory driver changes. All drivers also receive a 10-minute qualifying session.